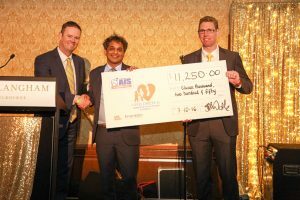 AIS topped off a successful week at its 2016 annual Annual General Meeting and Trade Show Conference, by breaking the $2 million barrier on purchases with suppliers at its annual trade show, held in Melbourne in September. The week began with the customary AGM, where all of the AIS Shareholders attending are presented with a summary of the business activity for 2016 and the forward company strategy for 2017. AIS group general manager (GGM), Stephen Wallace, said that the AGM is a vitally important part of business because it is an opportunity for all shareholders to truly understand what is going on in the independent group they are part of. “AIS had a breakthrough year on a number of fronts, not all of which may be easily presented in shareholder updates. This event allows each shareholder an opportunity to openly discuss the direction of the company, and if required, vote on key strategies to move the group forward,” Mr Wallace said. While the group has struggled to maintain its shareholder base over the last three years, it is pretty clear that the shareholders that remain, are forming a solid foundation by working much more closely together, Mr Wallace said. “The essence of an independent group is to have the ability to join together to maximise your buying and selling opportunities. With AIS, we deliver this on more fronts than other groups; with our key buying power across the industrial suppliers and our ability to continue to drive demand into our shareholders stores with our marketing program,” he said. One of the big successes of the AGM this year was a workshop on buying collectively, according to Mr Wallace, who said the workshop was very rewarding and allowed all of the AIS Shareholders to come together and enjoy a fun filled strategic session. “In 2016 our group has grown its purchases with AIS contracted suppliers with fewer shareholders than the previous year. This says a lot about the deals that were offered to shareholders and the value our marketing program brings each of them. They would not be purchasing the product if there wasn’t demand for it,” Mr Wallace said. “In 2017 we believe we can do even better than last year if our shareholders embrace the collective buying power even more and the workshops helped shareholders to embrace that ethos,” he said. Mr Wallace also commented on the growth of the sales data project that is now delivering results through the group. “To truly operate a marketing program that delivers, many things need to be in place. Your stores need to manage and improve on their retail disciplines, while the support office needs to deliver on key buying opportunities that are not only attractive for our shareholders, but also for the end customer. To do this you need to understand what product you are selling, when you are selling it and how many of them you are selling. If you do not have this basic information, then you are just flying blind and your stores will not achieve the outcomes they are looking for,” he said. “The implementation of this project at the end of 2014 has allowed our support office to understand the product and buying demands of the group. This will ultimately provide AIS shareholders with more return from each of the marketing campaigns and better buying opportunities in the future,” Mr Wallace said. Following on from the AGM on Thursday, Friday was a jam packed day of engagement. The day kicked off early with the supplier breakfast. Suppliers enjoyed a full catered breakfast, while Mr Wallace presented (with his category team) the key strategy for the coming year while. During the presentation Mr Wallace noted that, “our key preferred supplier’s partners are critical in the shareholder and support Office relationship. Our aim is to continue to provide value for our key supplier partners across a number of different metrics. We have and will continue to deliver their brands and products out to over 2.5 million readers each year with our promotional catalogues and over 2.1 million email recipients with our extended e–marketing campaigns. We believe collectively we deliver more to suppliers than other groups on this front. “One of the key initiatives with our suppliers in the coming year will be a focus on training. AIS shareholders are experts in their fields, but to do this, they need to remain up-to-date with the changing market, industry and product trends. In 2017 our focus is to collectively deliver a training program that our shareholders can engage with, and a program that our key supplier partners will benefit from. This will ultimately lead to more purchases of suppliers’ products and increased returns for our shareholders,” he said. After the breakfast, shareholders engaged with the key suppliers at the annual trade show which was held at the Mooney Valley Racecourse, in Melbourne. The trade show is an all-day event and a key part of the year for both shareholders and suppliers. The annual event reached a record high in purchases on the day for 2015, so all eyes were on the 2016 event results. With a record percentage of shareholders attending, there was all possibility for improved purchases on the day. “To get the most out of a trade show you have to bring great deals on the day. Suppliers have done that this year and our shareholders have acknowledged this by their attendance and their purchases. Some suppliers commented that even before lunch on Friday their purchases from the group on the day were over the previous year. 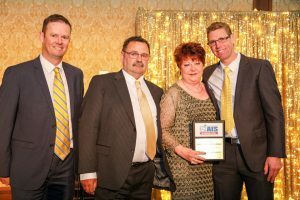 By close of business many were commenting that AIS had delivered a larger amount of purchases than any of the other independent groups at a trade show event this year. That is a big rap for a group like ours,” Mr Wallace said. Group general manager, Stephen Wallace; Small to Medium Format Shareholder of the Year award winners Peter Dyson and Karyn Dyson Shareholders from C & J Engineering and company chairman, Dean Candy. 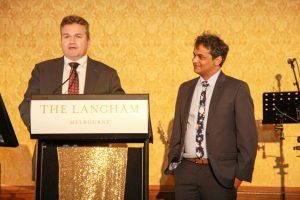 The finale to the entire week was Gala Awards Dinner held at the Langham Hotel Grand Ballroom, Melbourne on the Friday night. 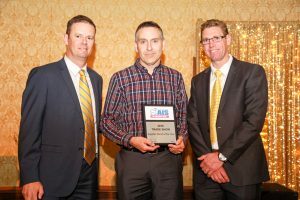 With key awards including Supplier of the Year, Small/ Medium Format Shareholder of the Year, Large Format Shareholder of the Year, and the charity auction, MC Brett Rutledge (procured for the fourth year), kept the program running smoothly as always. 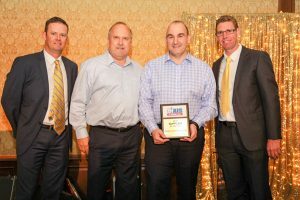 Large format shareholder of the year) Group general manager, Stephen Wallace; Large Format Shareholder of the Year award winner Bevan Branson of Alltools Geelong Pty Ltd and company chairman, Dean Candy. 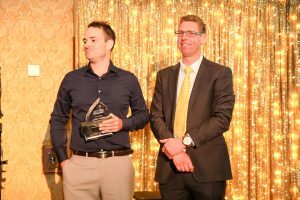 MC Brett Rutledge with Dr Mark Cruickshank – Senior Researcher representing the Children’s Leukaemia and Cancer Research Foundation. “Recognising excellence is something that we feel obligated to do each year. Those who put in the effort can help lead others to achieve improved results in the future and the awards ceremony allow us to acknowledge who we believed were the best of the best. We are also proud to be once again associated with the Children’s Leukaemia and Cancer Research Foundation, of which Justin Langer is the patron for, as our chosen Charity for 2016,” Mr Wallace said. “Our shareholders independently support many local charities and community groups which is part of being locally owned and operated, so it is great to be able to offer something from the whole group to this important charity. Over the last four years we have raised over $70,000 for Australian charities and are looking to ask our guests tonight to reach into their pockets one more time and support this organisation,” he said. 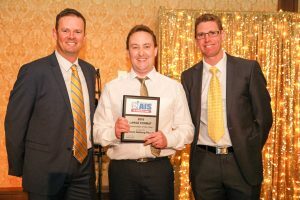 Presenting for the charity was Dr Mark Cruickshank, who with Brett Rutledge took the guests through the important work the foundation is doing to find cures for such debilitating diseases. The auction was held across four prize packs, with the auction providing a lot of fun and enjoyment for all, while the quick witted wordsmith, MC Brett Rutledge, added significant humour to the auction. At the conclusion of the auction, Dr Cruickshank received a cheque for $11,250.00. In addition the auction table donations were accepted on the night and the group finished with a total value of donations of $19,102.55. Group general manager, Stephen Wallace with Dr Mark Cruickshank – Senior Researcher representing Children’s Leukaemia and Cancer Research Foundation accepts the cheque, with company chairman, Dean Candy. With the event at a close Mr Wallace indicated that they are well underway in planning for the 2017, event which will be AIS’s 20th anniversary. The Gold Coast is the chosen location for the week’s event. Changes to the normal week plan will be occurring with an extra day of engagement for suppliers and shareholders. Mr Wallace believes it will be another successful event for the group. Group general manager Stephen Wallace, with Supplier Stand of the Year award winner Leigh Royle from the Sheffield Group, and company chairman, Dean Candy. Outgoing director Dean Hall with company chairman, Dean Candy.